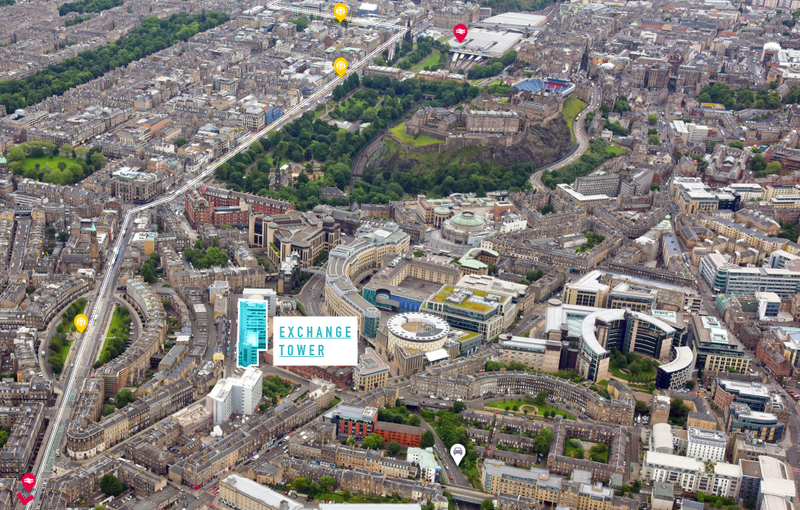 Exchange Tower occupies a prominent position at the junction of Canning Street and Torphichen Street, within the Exchange District, the city centre’s prime commercial location. The property provides immediate and convenient access to a full range of restaurants, bars, cafes and shops within the Exchange District as well as the West End. In addition the principal retail streets of George Street and Princes Street are close by. Edinburgh’s two main railway stations are within easy walking distance with Haymarket being approximately 500 yards away. The new West Princes Street tram stop is less than five minutes walk from the building. The World renowned Edinburgh International Conference Centre is located close by as are the five star hotels The Caledonian Hilton - A Waldorf Astoria Hotel and The Sheraton Hotel. Public car parking is available locally. The property provides immediate and convenient access to a full range of restaurants, bars, cafes and shops within the Exchange District as well as the West End.